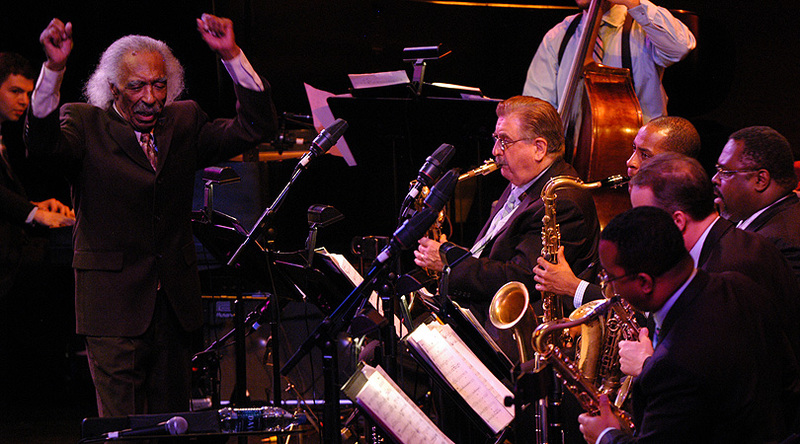 Gerald Wilson, beloved conductor, bandleader, composer, educator, and multi-instrumentalist, passed away in his Los Angeles home on Monday, September 8, 2014 after being diagnosed with pneumonia two weeks earlier. He was 96-years-old. Wilson’s accomplishments and contributions to the current state of jazz are countless, however several awards support such a bold claim. Most notably, Wilson was an NEA Jazz Master (1990); recipient of a NARAS President’s Merit Award; winner of multiple DownBeats’s Critics Polls and Jazz Journalists Assocation Awards; a NAACP Image Award nominee; and an eight time Grammy® Award nominee. After a 30-year career in music education at UCLA, he was awarded a Teacher of the Year award in 2008 for his mentoring of countless young musicians. Washington’s Smithsonian Institute also houses an archive of his life’s work. Despite earning such accolades throughout his career, Wilson’s road to success wasn’t always easy. He struggled through more than nine decades of opposition to contribute to the fight for civil rights and to share his passion for music with the world. Born in 1918 into a hotbed of racial tension in Shelby, Mississippi, Wilson was sent by his mother to live with family in Detroit where his musical talents afforded him the rare opportunity to attend the performing arts school, Cass Tech High School — a high school that was second only to Julliard at the time. As Wilson would tell you, this is where his musical career truly began. After serving time in the Navy during World War II, reaching commercial success in the late 40’s and marrying his soulmate, Wilson’s passion for cultural immersion came to life both emotionally and creatively. Wilson’s prolific seven decade career is rich and varied and always infused by his endless appetite for life. In June of 2011, Wilson released his fifth Mack Avenue album, Legacy, a follow up piece to his 2008 release Chicago. Having been one of the first musicians to pioneer the use of eight-part harmonies in compositions, Wilson has contributed both compositions and arrangements to musical icons including Ella Fitzgerald, Billie Holiday, Ray Charles, Duke Ellington, Dizzy Gillespie, Count Basie, Nancy Wilson, Sarah Vaughan, and many more. Wilson was also honored to receive an invitation from Zubin Mehta to compose a number for the Los Angeles Philharmonic orchestra. This would be followed later in life by additional commissioned works from both the Monterey and Chicago Jazz Festivals. Wilson is survived by his wife Josefina; son Anthony; two daughters, Jeri and Nancy Jo; and four grandchildren. Funeral arrangements and a memorial service are pending.